Unquestionably, the acoustic blues guitar of the Mississippi Delta played a huge role in the development of modern popular music—in fact, there just might not be any rock and roll to speak of without it. While the first blues recordings featured female singers and sophisticated musical arrangements, the blues that came out of the Mississippi Delta were more primitive in nature, rougher around the edges. The guitar didn’t play a big role in the urban blues of singers such as Ma Rainey and Bessie Smith, but when it comes to Mississippi blues, the style that has come to be known as Delta blues guitar is the focal point. The acoustic-based Delta blues guitar of Mississippi formed the foundation for the electric guitar of Chicago blues—what most people think of when they think of blues guitar today. The energy and raw intensity of the Mississippi Delta blues made a deep impression on young British musicians like Eric Clapton and the Rolling Stones, who themselves helped turn the guitar into the iconic instrument of popular music. So if you want to get to the roots of the guitar’s lineage, you’ve got to start down in the Mississipi swamps. The hot, humid Mississippi Delta is often credited as the birthplace of the blues. While this is not really accurate—the blues also developed in the Southeastern United States, Louisiana and Texas—it does point to an interesting fact: Mississippi produced a unique style and sound that had an enormous impact on modern music. Robert Johnson is the most well-known musician from the Mississippi Delta—you know, the fella who sold his soul to the devil. 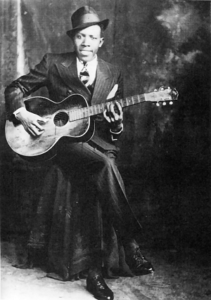 At the time of his death in 1938, however, Johnson was only one of numerous excellent blues guitar players making a name for themselves down in the Mississippi Delta. Johnson followed in the gargantuan footsteps of older musicians such as Charlie Patton and Son House—and if you were to make an early Mississippi blues Mt Rushmore, these would be three pretty good fellows to start with. The interesting thing is that these three legendary Mississippi bluesmen don’t really sound very much alike at all, both their guitar and vocal styles were considerably different. Add other pivotal Mississippi blues players into the mix such as Tommy Johnson and Skip James, and it is easy to see that what’s come to be known as “Delta blues guitar” incorporates a wide spectrum of styles that are a bit hard to pin down into one solid definition. The first thing to do if you want to play Delta blues guitar is to get rid of your guitar pick and get familiar with using your thumb. There is no set pattern for how the thumb is used. Some players let the thumb do the majority of the work—their thumb plays both the treble strings and the bass strings. 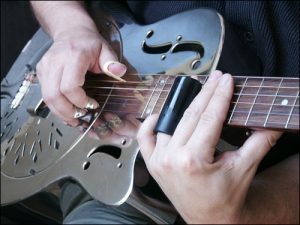 Other Delta blues guitar players use the thumb only on the bass strings—the thumb usually plays a steady root note with the open string while the fingers play melody notes or guitar riffs on the treble strings. Without exception, the most common keys in Delta blues guitar are E major and A major, which are both easily accessible in standard guitar tuning. Typically though, open guitar tunings are utilized, because they make slide guitar playing easier to execute. If we had to pick a third most popular, it would likely have to be G major, which features heavily in some well-known songs from this era. Songs in the key of G major are usually played in an open G tuning with the root note on the 5th string (which Keith Richards would later make famous across the pond). Mississippi blues songs are usually built more around guitar riffs rather than recognizable melodies. Players like Charlie Patton and Bukka White had signature guitar riffs that would appear in several songs. They would play the same guitar riff while simply changing the lyrical content. There are a few exceptions to this riff-centric rule, but the most notable is probably Blind Willie Johnson, whose songs feature more prominent, and even catchy vocal melodies. Older players like Charlie Patton, Son House, Skip James and others often played songs with two chords rather than the three-chord style that became popular later. (Typically it would the IV chord that would be left off from the traditional I-IV-V pattern we’ve all come to know and love). By the time Robert Johnson came along, 12 bar blues was more in vogue, and it features heavily in his music. The acoustic blues guitar of the original Mississippi blues players has an emotional intimacy and vocal quality that often gets lost in the world of electric blues. While electric blues, and the rock music it inspired, can certainly become just a vehicle for endless guitar solos, the relationship between guitar and voice in Delta blues is far more intimate. The guitar itself has a vocal quality that complements the singer in a call and response structure similar to gospel music, and traditional African music before it. Last, but certainly not least, one of the most distinguishing—and probably most well-known—features of the Delta blues guitar style is the “bottleneck” or slide guitar (which takes its name from the fact that the slide would typically be made from the neck of a wine bottle). Because of its expressive quality, in the hands of different players, the tone of the bottleneck slide can range from a primitive growl to a sophisticated sweet sound, as is the case with Blind Willie Johnson’s guitar tone. Playing with a bottleneck gives the guitar a vocal-like quality that nicely serves the call and response structure of these songs. Whether you consider yourself a “blues” musician or not, it’s hard to deny that many (even most) forms of popular music, from Rock to Jazz, Funk to Soul, and even Pop, have their roots firmly in early American blues. As such, no matter what style of music you favor, it’s useful to know where it came from, and study the techniques that played such a big part in making it so unique and influential. Why Use a Clean Boost Pedal?